Eastleigh Football Club are delighted to announce a pre-season fixture vs. Southampton FC's Development Squad. The game will take place at the Silverlake Stadium on Monday 4th August at 7pm. 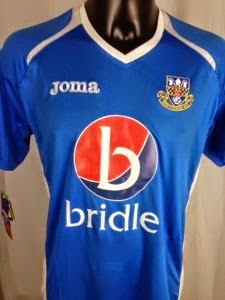 Eastleigh Football Club and Joma are delighted to unveil the new home and away kit for the 2014/15 season, which is available now for pre-order. The Spitfires have continued with their royal blue and white home and away kit due to the success and feedback of last season’s kit. Bridle Insurance will continue as the clubs main shirt sponsor with Silverlake auto recycling also advertising on the back of the shirt. The kit is designed using 100% Polyester with anatomically placed ventilation to keep you cool and fresh. Prices start at £33 for adults and £22 for kids but there is the option of a 10% discount for all TSSC (The Spitfires Supporters Club) members. The club is also offering the option to print your favourite player’s names and numbers ahead of our first season in the conference premier. Prices for the official conference lettering and numbers start at £1 a letter and £4 per number. 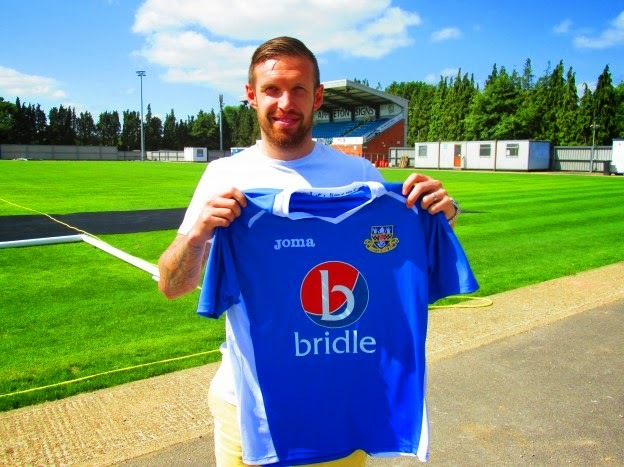 Eastleigh FC are delighted to announce the signing of Paul Reid on a free transfer. The 32 year old defender has signed on a 2 year deal after being released from Northampton Town. Reid started his career with his home town club Carlisle United, where his performances in the 1999–2000 season won him a £600,000 move to Rangers. In 2000 he represented the England under 19’s and was capped against the Netherlands. During his time at Rangers, he had the opportunity to play on loan at Preston North End and Northampton Town, before he signed a permanent deal with the Cobblers in 2003. He was later sold to Barnsley in July 2004, and captained the club to promotion out of League One via the play-offs in 2006. Reid has gone on to make over 140 appearances for Carlisle United, Colchester United and Scunthorpe before being released from Northampton town at the end of last season. We will bring you further details of any other pre-season fixtures as they are arranged. The club are also happy to announce that tickets for our three home games will be £8 or a special offer of £10 for all three fixtures. For more information or to order your you pre-season ticket please contact the club on 02380 613 361. 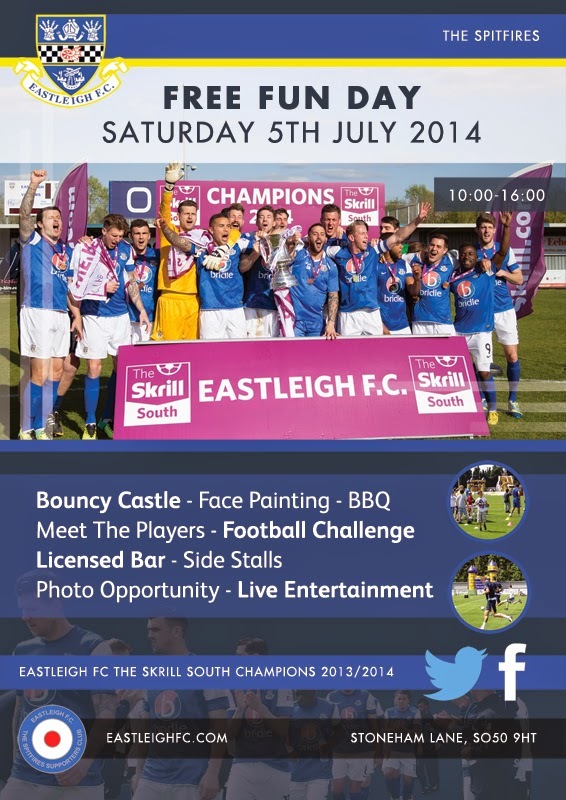 On Saturday 5th July Eastleigh FC will be hosting their annual family fun day at the Silverlake Stadium. The fun day is FREE for everyone and will run from 10am till 4pm. There will be events and games running throughout the day as well as a BBQ, live entertainment and a chance to meet the players. For more information please call 02380 613 361. Eastleigh FC are delighted to announce that due to the great initial response from fans regarding the early bird season ticket offer we will be extending the deadline until Tuesday 1st July at 5pm. We have already surpassed our expectations with over 500 tickets being sold of which over 200 are new season ticket holders. We are hopeful that by extending this offer it will encourage even more fans to attend the Silverlake Stadium for what is our first season in the Conference Premier. The club are continuing to work hard both on and off the pitch with player recruitment and ground developments. The philosophy of our club is to ensure the match day experience is to the best standard possible, whilst also making football affordable for the whole community. We feel that the extension of the early bird offer will contribute to that aim. Anyone interested in this offer should contact the club on 02380 613 361.